Rollin Karg started out as an industrial engineer and tried different forms of art in his spare time. Glass blowing was the most fascinating form of art that he tried. It is not easy sticking his head into a hot furnace and burning the hair off his forehead but it’s in his nature to take challenges like this. “Ara’s Flight” is named for a very special little girl. Her arrival was greatly anticipated, full of joy and excitement. 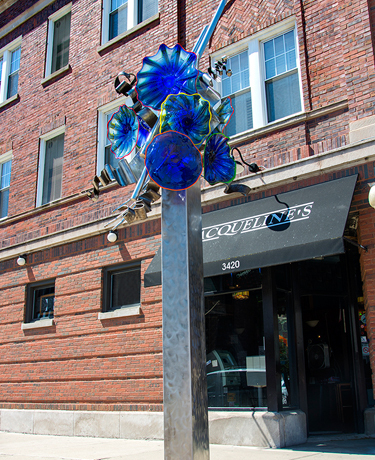 This sculpture is made of stainless steel with cobalt blue glass platters trimmed in a kaleidoscope of colors. Stainless steel flags have the appearance of waving in the wind. Ara’s Flight gives the impression of something more to come. It is reminiscent of a gaily decorated gift with ribbons and bows. Celebration and joy are clearly intended. Rollin assures us that meeting Ara brings great joy.